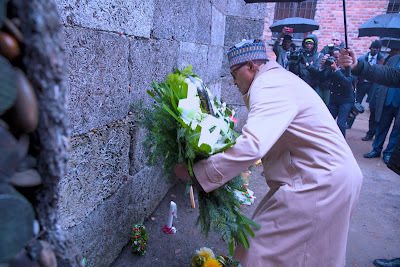 at Auschwitz-Birkenau Memorial and Museum in Oswiecim, Poland. 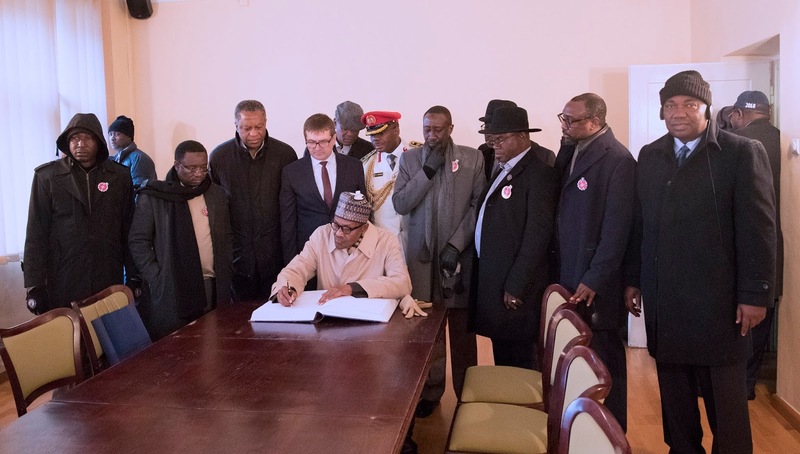 President Muhammadu Buhari flanked by Minister of Foreign Affairs, Mr Geoffrey Onyeama, NSA Maj Gen Babagaana Munguno, Kogi State Governor, Alh Yahaya Bello, Niger, State Governor, Alh Abubakar Sani Bello, Enugu State Governor, Rt Hon Ifeanyi Ugwuanyi and others as he signed the visitor's diary at the Nazi concentration camps in Oswiecim, Poland. PHOTO; SUNDAY AGHAEZE. DEC 4 2018.